I was dealing with a very teary little boy yesterday morning, and it took me about an hour to even get him dressed! 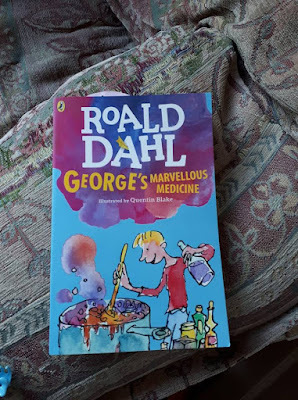 So I took some time to snuggle up in bed with all three kids and read some more of George's Marvellous Medicine by Roald Dahl. All three are totally transfixed by it, and my daughters kept laughing at his descriptions of the mean old grandma in the book. 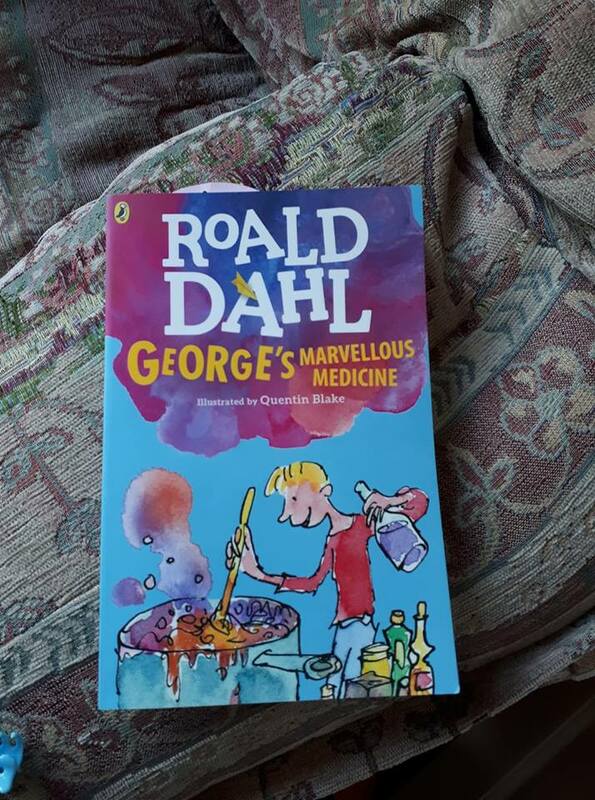 My eldest was even keen to have it read to her instead of telly time. I'd read somewhere that he makes a master story teller out of all of us, and I certainly feel that's true. You can't help but do funny voices and get caught up in the moment, my voice was hoarse afterwards! Such a fun book to read aloud! One of the thing I was so excited about when we decided to start a family was that I was going to have children to read to and make fall in love with books like I have. What's your favourite book to read out loud to children? Any book by Alan & Janet Ahlberg - we all loved the character illustrations and alliteration of text. We also read Michael Rosen's The Bear Hunt so many times that we could recite it off by heart (& I probably still can!!). We also had a board book a book of household items which they would match by pointing to things in our own house, & one with pictures of a hidden teddy bear, which they would point to as babies barely able to sit up. My girls loved the description of grandma's mouth looking like a dogs bottom, I still giggle thinking about it. We loved all his books, have you read Revolting Rhymes, brilliant! i read so much to my kids when they were little! they would probably still like me to read them books! i can't wait for grandkids! Depends on the mood, Wow said the Owl and Goodnight Moon for calm bedtimes and If I painted the World but just sheer sillies it's Mr Men. But like your family we just love books and will read anything. The essential idea hidden Chinese medicine generic viagra is Tao intelligence or "the Way," in light of the significant knowledge of Lao Tzu, the writer of "Tao Te Ching" thought of nearly 2,600 years prior.